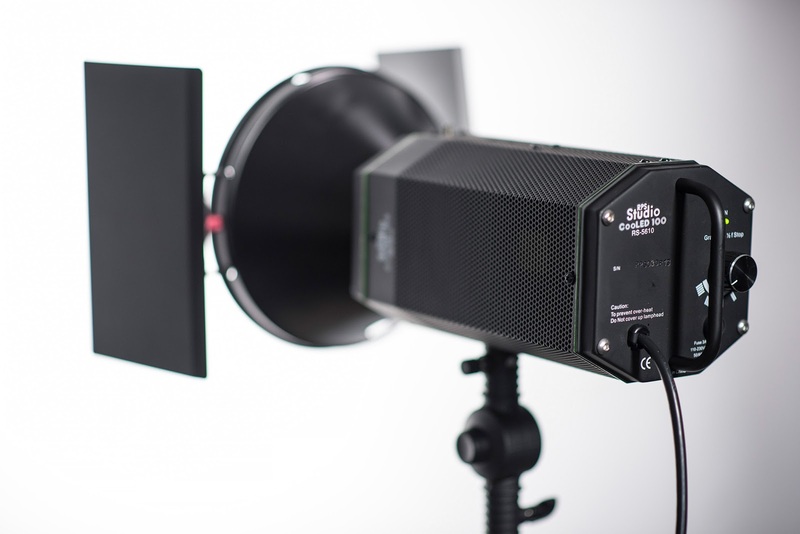 Shooting with bigger LED lights. A follow on from an earlier post about the RPS CooLED 50. It's big brother. We take up where we left off yesterday and plumb a little deeper into the RPS line of SMD LED lights. These are the kind of lights that I think are the next step in the evolution of LED lighting for photographers and videographers. Not that RPS lights specifically are the "next step" but that the SMD LED technology is beginning to roll out not just in higher end lights but in lights that just about everyone practicing their imaging craft can afford. The RPS models are just the first, lower price options, with the kind of power and configurability I need that hit my radar. There are lots of competing brands out there at higher price points and from recognizable photo oriented brands. Although I did a lot of work with the earlier LED panels ("a thousand points of light...") I had circled back and by this Summer I was mostly using electronic flash again for a lot of my work. It seemed easier. The bigger panels are just big enough to be a handling burden but not so big that they don't still require more diffusion and modifiers to make their effective radiating size big enough to give me the soft shadows I like in a portrait. With a powerful flash you can bang light through a kingsize bedsheet, if you want, for all the softness you'd ever want. If you need more power it's typically there in reserve. But then Ben came home from school and I wanted to make a nice portrait of him. Problem: He's the world's fastest blinker. His blink reflexes are off the charts. I was getting a 10 % hit rate with electronic flash in soft boxes. So I switched to a constant light source and a quicker frame rate and all the blinks subsided. A good enough reason to take another look at LEDs. Shortly after that a big ad agency booked me to help them create video content for their website and we ended up on location in a series of conference rooms; all of which needed to be lit. We certainly couldn't to it with flashes so we fell back to LEDs and it worked well --- but I found myself wishing for harder, stronger light sources and nostalgic about the days when we used to light with tungsten spots backed up by 1,000 watt ratings. I have a bunch of smaller panels and they are great for modest sets or as accent lights to boost an effect but they don't have the punch I really wanted. When I saw the first RPS light (the CooLED 50) I thought, "well, someone is on the right track and the price is right but.....I'm sure the color will be off or the power won't match the bulk of the unit." I was beyond surprised when I did a color test. 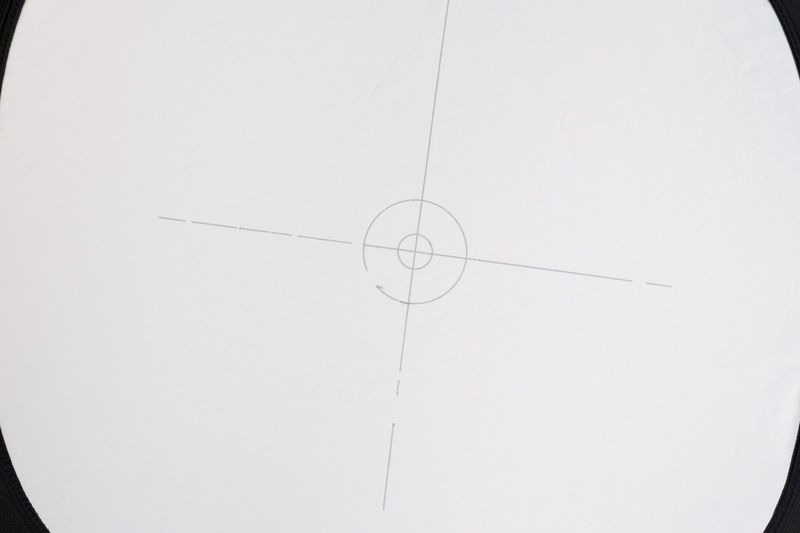 I set up a white Lastolite test target and illuminated it with the diffused CooLED 50. I took RPS at their word and set a manual WB by selecting an exact Kelvin color temperature. The box said, "5200K" and that's what I set on the camera. I expected the light to be much bluer and I steeled myself for a trip to GEAR to buy some M/G axis filtration. When I opened the files in PhotoShop CC and stuck an eyedropper on the white (with detail) of the target I was pretty (happily) surprised to find the R.G.B. reading to be something like 245, 246, 245. No hue tweaking required to get to neutral. I measured the Fiilex P360 (same basic technology and a known performer) and it comes in right at 5400K. Not a big jump and certainly in the ballpark for my work. When I saw how great the color was I immediately started thinking about the fixture I had passed up at Precision Camera. It was the CooLED 100 and it was, at $299, just $100 more than its baby brother. I got back in the car and went back to fetch it, ASAP. I was in and out of store in 10 minutes and had both lights set up in a favorite portrait configuration within the hour. The only real difference between the lights (besides the cosmetic touches) is the one full stop increase in power. Both have umbrellas mounts (though I would need wider reflectors to use umbrellas effectively) and both have the same color and overall feel to the light. Both are fan cooled but both are quiet enough to use for all but the most auditorially sensitive video projects. The nice thing about both is that they have PUNCH. If you need extra punch you can take the diffuser cones off the lights and you'll have a 1.5 by 1.5 inch light source that's as specular and hard as you would ever want!!! (for safety reasons never look directly at the bare SMD while lit. The light rays are collimated enough to do real damage to your eyes!!!). 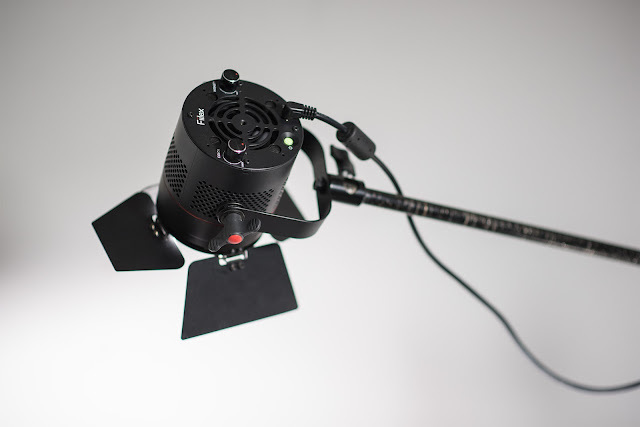 The smaller light source (with more power) gives you many more lighting options starting with more through and ending up with more flexibility in choosing modifiers. I think the big light would be at home in a medium softbox, but I mostly push the light through diffusers on square frames. 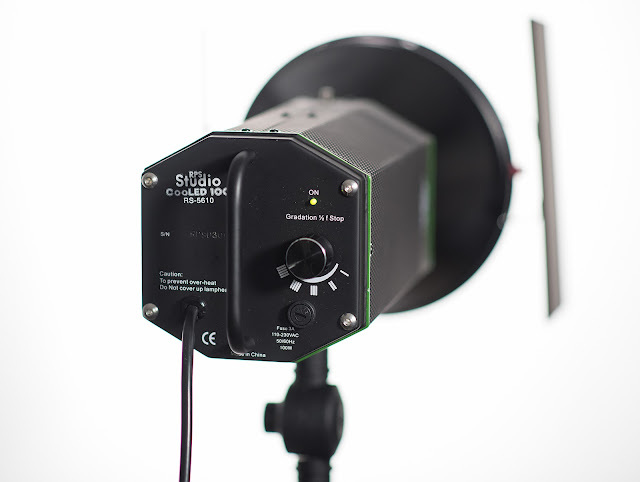 I like the control and I light the subtle differences of the light being closer or further away from the diffuser. With a weak enough diffuser you can create a hard source within a soft source and that's way cool. The back end of the CooLED 100 with a five position power knob calibrated in half stop increments. 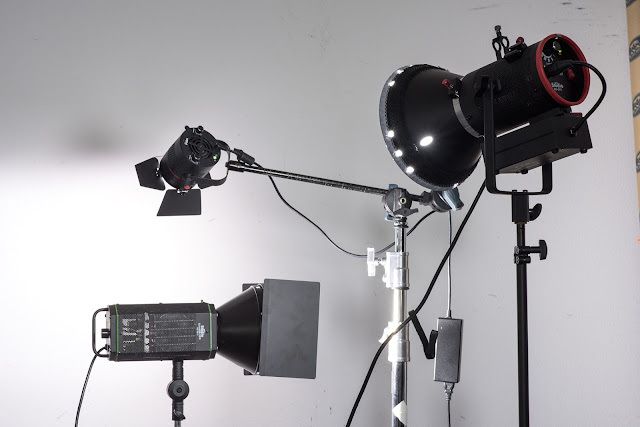 The two different RPS lights an the Fiilex P360 banging neutral light onto the back wall of the VSL celebrity studio. Here's my raw, uncensored test target right at 5200K. Bottom line: Do I like them? I liked them enough to buy them at retail like everyone else. If you mostly do weddings and events then these aren't the lights for you. If your assignments take you all over the map and you also shoot video then I'd say these would do you well. If you have a bigger budget then there are sturdier and more compact lights like the Fiilex line that might be a better long term investment but these are right there in the same output quality ballpark. I am saving up money to buy a couple more in both flavors. A great light for someone shooting back and forth between stills and video on the same shoot.